Visit her online at www.laurenmillerwrites.com. Since I adored her first two novels, TIME BETWEEN US and TIME AFTER TIME, I have very high hopes for Tamara Ireland Stone’s latest, EVERY LAST WORD, which will be out next year. The story follows a competitive swimmer with OCD who is taken in by the misfit members of a secret poetry club that meets below the school theater. I can’t wait to see how Tamara weaves poetry into what I am sure will be a beautifully rendered coming-of-age story. I devoured Jessica’s first two novels, ORIGIN and VITRO, which are companions to KALAHARI. Each book in this trio (which isn’t a trilogy, because each story stands alone) is set in an exotic location and revolves around a chilling science experiment conducted by Corpus, a nefarious multinational company. Set in the Kalahari dessert, KALAHARI is a high-stakes conspiracy story about a contagious and deadly virus that Corpus has unleashed in Africa. I have no doubt that this story, like ORIGIN and VITRO, will be smart, fast-paced, and completely addicting! I need the last installment of Jessica’s UNREMEMBERED trilogy pronto! The story, which concludes this year, revolves around Seraphina, a girl who wakes up at the beginning of the first book floating among plane wreckage with absolutely no memories. She has no idea who she is or how she got there or why she has these crazy abilities like superspeed and fluency in other languages. I don’t want to spoil the reveals (there are many!) for those who haven’t yet read the first two installments of the story, so just take my word for it and get your hands on UNREMEMBERED and UNFORGOTTEN before UNCHANGED hits shelves next year. 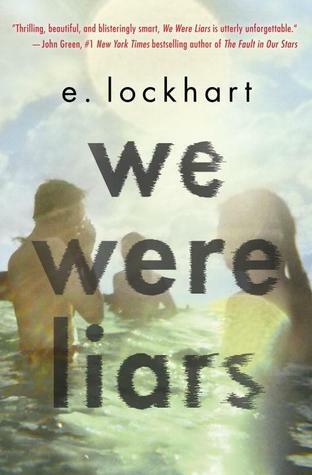 Everyone reading this post probably knows more about E. Lockert’s new novel than I do, because I refuse to even read the synopsis for WE WERE LIARS, paranoid that it will spoil what everyone is saying is a haunting, super twisty read. I want to maximize the emotional and psychological enjoyment of what I expect to be one of the summer’s best reads, so I’m going to stay as clueless as possible until I start reading, which I plan to do when I get home from book tour next week! I cannot rave enough about this unforgettable novel. I was in a reading rut until I picked up Jessi’s new book. It had me utterly captivated from the very first page! GOLDEN is a compelling mystery—what happened to Juliana Farnetti the night her car plunged into the lake—and a emotionally rich coming-of-age story for Parker, the girl who reads Juliana’s journal ten years later and starts asking questions. I finished this book a week ago and can’t stop thinking about it. So good! From the author of Parallel comes a high-stakes romantic puzzler set in a near-future where everyone’s life is seamlessly orchestrated by personal electronic devices. Fast-forward to a time when Apple and Google have been replaced by Gnosis, a monolith corporation that has developed the most life-changing technology to ever hit the market: Lux, an app that flawlessly optimizes decision-making for the best personal results. Just like everyone else, sixteen-year-old Rory Vaughn knows the key to a happy, healthy life is following what Lux recommends. When she’s accepted to the elite boarding school Theden Academy, her future happiness seems all the more assured. But once on campus, something feels wrong beneath the polished surface of her prestigious dream school. Then she meets North, a handsome townie who doesn’t use Lux, and begins to fall for him and his outsider way of life. Soon, Rory is going against Lux’s recommendations, listening instead to the inner voice that everyone has been taught to ignore—a choice that leads her to uncover a truth neither she nor the world ever saw coming. Keep up with our best young adult book selections by following along with our Best YA Books tag.